The Detroit Auto Show got a whole lot more interesting this year thanks to a host of exciting new cars and concepts from the European and Japanese car makers. The Detroit Auto Show has been declining in international significance for a decade or so now, and what with the parallel decline of the might of the 'Big Three' US car makers, Motown's annual January event was in serious danger of being marginalised in favour of the LA Auto Show before or the New York exhibition in April. But something changed this year, as the European and Japanese companies came out in force with more than a handful of exciting new cars and concepts. Here's the full A-Z lowdown. Star of the Audi stand was the new allroad shooting brake concept car. For a concept it's remarkably restrained, though rather than pointing to how a new Audi Q1 will look, we expect the shooting brake holds clues to the next-gen Audi TT coupé. Due to be revealed sometime this year, the next TT features the same advanced dashboard as the allroad concept (albeit toned down a tad), plus much of the detailing. It should prove to be handsome, if nowhere near as ground-breaking as the very first TT. The Bentley Continental GT V8 S made its North American debut in Detroit, giving buyers a relatively affordable, but still sporty, version of the evergreen grand tourer. Headline figures are 521hp and 680Nm of torque, with 0-62mph in just 4.5 seconds. The Bavarian company's stand was chock full of new models, but as BMW released information well ahead of the Detroit show they seemed to be less newsworthy. Saying that, the M3 Saloon and M4 Coupé were big hits with everyone that saw them - and we cannot wait to drive them. The M235i Coupé looked quite meek in comparison, but as we discovered a few days later, is a belter from behind the wheel. Oh, and there was a mildly facelifted BMW X1 too. The American company that is now fully-owned by Fiat rolled out its new 200 saloon, in 200C and 200S guises, powered, for the moment at least, by a range of petrol engines. Management were bullish about the Chrysler 200's prospects against European and Japanese alternatives, though didn't expressly mention whether the 200 would be produced in right-hand drive. We all knew that GM had a hard-core Corvette up its sleeves for Detroit, and it didn't disappoint. The Z06 houses a supercharged 6.2-litre V8 engine, producing 634hp and 861Nm of torque. It's packed with 'race-proven' technology and features a prominent aero package. There's more to come too, as the company let slip that a 'Z07' package makes the Corvette faster than the previous generation ZR1 model. Alongside the Z06 was the new Stingray-based racer, the C7.R. As we'd all seen the new Mustang and more at Ford's 'Go Further' event at the end of 2013, the Detroit show was a bit if a non-event for news hounds on the Ford stand. Except of course for the very latest and greatest F-150 pick-up. Big news on the Hyundai stand was the launch of a new Genesis luxury saloon. It's a stylish piece of kit of apparently high quality, but we can't see the brand competing with the established European marques at this level in this part of the world for some time yet. Despite that, the Genesis will be produced in right-hand drive. Kia's PR machine did a good job ahead of Detroit, teasing just the right amount of information about its GT4 Stinger concept to keep us all interested, but not so much that we didn't bother turning up to the press conference. The new two-door coupé concept was worth the wait. It's an unusual design, which suggests it's not quite production ready, but the intent to make a rear-drive, affordable sports coupé is there. Whether it comes to market with a turbocharged 315hp engine remains to be seen. On the Lexus stand, every car was painted bright white, except for a lone example of the company's new RC coupé. And by the end of the first press day there was still a rather large empty space to the right of this RC 350 model. That's for the new RC F, a rival to the BMW M4 Coupé powered by a 5.0-litre V8 engine. Plenty to see on the Mercedes-Benz exhibition, including the V12-engined S 600 at the top of the range, the 360hp GLA 45 AMG super-SUV and then the star of the stand, the all-new Mercedes-Benz C-Class. Looking for all the world like a junior S-Class, the new 3 Series rival features a high quality interior and loads of engine options, including the promise of diesel models with emissions as low as 98g/km, plus plug-in hybrid versions in the future and loads of technology - including semi-autonomous driving. For many people, the Detroit show was the first chance to take a detailed look at the new generation MINI Hatch, but it was also the world debut of the John Cooper Works (JCW) concept. Expect the production model to be little different, though MINI has yet to confirm that power comes from the Cooper S's new turbocharged 2.0-litre engine, as opposed to the 1.6-litre unit of old. The American journalists were all oohing and aahing over the (admittedly quite tasty) Nissan Sport Sedan concept, but Detroit gave us another chance to get up close and personal with the IDx twins that debuted at the Tokyo show last year. Cracking retro coupés we hope get made. Back to that concept car, apparently it holds styling details we'll see on the next Nissan Juke crossover. Porsche itself must have been surprised by the amount of interest its main exhibit garnered. The 911 Targa is, in effect, a halfway house between the 911 coupé and the 911 Cabriolet, and certainly nothing radical. Saying that, Porsche looked to the original Targa from the sixties for inspiration and we reckon this is the best-looking variant of the 911 line-up right now. Odd that it's only available with four-wheel drive though. Subaru waited until day two to reveal its new WRX STI, and fans of blue paintwork and gold wheels were not disappointed. It hardly moves the game on though, does it? 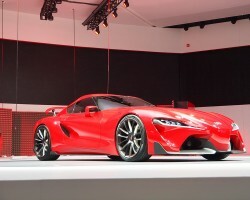 With much whispering about a possible replacement for the Supra coupé, the Toyota stand was jam-packed ahead of its press conference, and we were treated to a welcome surprise, in the shape of the stunning Toyota FT-1 concept car. Yes, it has more than a hint or two of TVR and Viper about it, but it's none the worse for that. Has the Japanese company really shrugged off its previous conservatism in a bid to rejuvenate its image? Here's hoping. The Beetle Dune concept would be more at home in LA than the freezing cold of Detroit, but it's still a fun show car. While we've been here before with Volkswagen the rumours of a production-ready Cross Beetle waiting in the wings are persistent. Volvo let us see its Concept XC Coupé ahead of Detroit, but only when viewing it in the metal did we truly appreciate its proportions. It's quite long and very very wide. It's unlikely to make production as is, but the detailing bodes well for the next new Volvo, an all-new XC90 SUV.